A case of persistent FACIAL NEURALGIA cured by a few doses of PULSATILLA 30. Case was worked out within five minutes using QUICKPICK tool of Similimum Ultra Software. Patient was a 27 year old young lady. She was having violent pain in whole right side of her face since 3 months. A lot of expert physicians have been consulted, a lot of investigations including MRI done, and pain killers taken. Investigations revealed nothing. The young lady was in a pathetic condition when she came to me. 1. [Boericke]Face : PROSOPALGIA Pain (face-ache) : Location : Unilateral : Right:- Aran., Cact., Caps., Cedr., Clem., Coff., Colch., Hyper., Kalm., Mag-p., Mez., Puls. Then I asked her when this pain is worse or better. She said NIGHT is really a nightmare for her. Pain starts by evening and reaches its maximum by night. She cannot sleep the whole night. Tears will flow from both eyes during pain. 2. [Boericke]Face : PROSOPALGIA Pain (face-ache) : Modalities : Aggravation : Evening, night, in:- Ars., Caps., Mag-c., Merc., Mez., Puls., Rhus-t.
3. [Boericke]Face : PROSOPALGIA Pain (face-ache) : Concomitants : Lachrymation:- Bell., Ip., Nux-v., Plan., Puls., Verb. 4. [Boericke]Face : PROSOPALGIA Pain (face-ache) : Modalities : Amelioration : Cold applications:- Bism., Clem., Kali-p., Phos., Puls. Pain was intolerable if she took anything warm, or applied any warm coverings. Same time, she felt very chilly during pain. 5. [Boericke]Face : PROSOPALGIA Pain (face-ache) : Modalities : Aggravation : Warmth:- Cham., Glon., Kali-s., Merc., Mez., Puls. 6. [Boericke]Face : PROSOPALGIA Pain (face-ache) : Concomitants : Chilliness:- Coloc., Dulc., Mez., Puls., Rhus-t. Selected rubrics were collected in RUBRIC BASKET of the software. 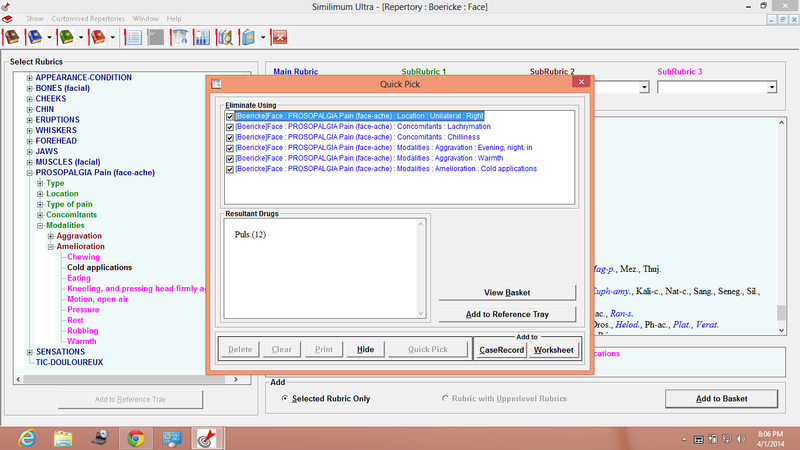 Then I clicked the ‘QUICK PICK’ button on that window, and eliminated using all the selected rubrics. ONLY PULSATILLA REMAINED AFTER ELIMINATION. 12 MARKS FOR 6 RUBRICS. That showed PULSATILLA was very strongly indicated in this case. PULSATILLA 30 was given in liquid form, advising to take 2 drps tds everyday, and more frequently during pain. Asked to come back after TWO WEEKS. Next morning, husbabnd of the lady called me over phone and said that she slept well last night. Pain was there, but it is tolerable. By the end of ONE WEEK, they informed me the pain has completely disappeared. I asked them to continue medicine twice daily for next week. Now it is THREE MONTHS. The patient almost forgot her painful desperate days. Now she is taking PULS 30 once a week. A notable thing in this case is, the similimum was selected using PARTICULARS only. No MENTALS. NO PHYSICAL GENERALS. Modalities, Concomitants and Location of pain led to the similimum. And the CURE WAS COMPLETE.